Dr Panagiotis Mergos graduated in Civil Engineering from the Aristotle University of Thessaloniki, Greece in 2001. He subsequently obtained an MSc in Seismic Design of Structures from the same Department in 2002 and an MSc in Earthquake Engineering from the University of Pavia, Italy in 2003. In the same year, he carried out research on seismic isolation of bridges at the Tokyo Institute of Technology, Japan. In the following years, Panagiotis worked as a researcher at the Aristotle University on research programs relative to the assessment of seismic risk and then as a professional structural engineer on projects associated with the static and seismic design, assessment and retrofit of important buildings and bridges. In 2011, he completed his PhD at the Aristotle University of Thessaloniki in the field of seismic assessment of reinforced concrete structures. In 2012, he became a post-doctoral researcher at the Earthquake Engineering and Structural Dynamics Laboratory of the Ecole Polytechnique Fédérale de Lausanne, Switzerland, where he conducted research on the development of loading protocols for cyclic testing of structures. 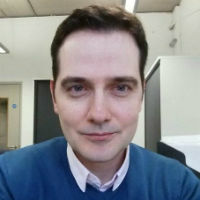 In 2013, Panagiotis was appointed Lecturer in Structural Engineering at City University, London. Mergos, P.E. (2016). Optimum design of reinforced concrete frames according to EC8 and MC2010 with genetic algorithms. Mergos, P. and Kappos, A. (2013). Damage Analysis of Reinforced Concrete Structures with Substandard Detailing. In Papadrakakis, M., Fragiadakis, M. and Plevris, V. (Eds. ), Computational methods in earthquake engineering - Volume 2 (pp. 149–176). Springer. Zimos, D.K., Mergos, P.E. and Kappos, A.J. (2017). A model for non-linear dynamic analysis of substandard reinforced concrete members. Zimos, D.K., Mergos, P.E. and Kappos, A.J. (2015). Shear hysteresis model for reinforced concrete elements including the post-peak range. Mergos, P.E. and Kappos, A.J. (2015). A combined damage index for seismic assessment of non-ductile reinforced concrete structures. Mergos, P. and Kappos, A.J. (2014). Estimating strain penetration fixed-end rotations of reinforced concrete beam and column members. 2nd European Conference on Earthquake Engineering and Seismology 24-30 August, Istanbul. Mergos, P. (2013). RCCOLA-DBD: A computer program for direct displacement based design of RC bridge piers for limiting material strains. Vienna congress on recent advances in earthquake engineering and structural dynamics (VEESD) 28-30 August, Vienna, Austria. Mergos, P. and Beyer, K. (2013). Developing loading protocols for quasi-static cyclic tests in regions of low to moderate seismicity. Vienna congress on recent advances in earthquake engineering and structural dynamics (VEESD) 28-30 August, Vienna, Austria. Mergos, P. and Beyer, K. (2012). Modeling shear-flexure interaction in equivalent frame models of slender RC walls. 15th World Conference on Earthquake Engineering (WCEE) 24-28 September, Lisboa, Portugal. Loukatos, N., Tzanetos, N., Mergos, P. and Kritikos, E. (2011). Seismic Retrofit of a 144m Road Prestressed Concrete Bridge. International Conference on Bridges and Soil-Bridge Interaction (IBSBI) 13-15 October, Athens, Greece. Mergos, P. and Kappos, A.J. (2011). Local Damage Index for Seismic Assessment of Gravity Load Designed RC Structures. 7th International Congress on Computational Mechanics (GRACM) 30 Jun 2011 – 2 Jul 2011, Athens, Greece. Mergos, P. and Kappos, A.J. (2011). Seismic Damage Analysis of RC Structures with Substandard Detailing. 3rd International Conference on Computational Methods in Structural Dynamics and Earthquake Engineering (COMPDYN) 25-28 May, Corfu, Greece. Mergos, P. and Kappos, A. (2011). Seismic damage analysis of reinforced concrete structures with substandard detailing. COMPDYN’11 25-28 May, Corfu, Greece. Mergos, P. and Kappos, A.J. (2009). Modeling Gradual Spread of Inelastic Flexural, Shear and Bond-Slip Deformations and their Interaction in Plastic Hinge Regions of R/C Members. 2nd International Conference on Computational Methods in Structural Dynamics and Earthquake Engineering (COMPDYN) 22-24 June, Rhodes, Greece. Mergos, P. and Kappos, A. (2009). Modelling gradual spread of inelastic flexural, shear and bond-slip deformations and their interaction in plastic hinge regions of R/C members. COMPDYN’09 22-24 June, Rhodes, Greece. Kappos, A.J. and Mergos, P. (2007). An Advanced Member-Type Model for the Seismic Assessment of Existing R/C Members. 7th National Congress on Seismology & Seismic Engineering 26-28 September, Lisboa, Portugal. Kappos, A.J., Mergos, P., Penelis, G. and Stylianides, T. (2006). Second Level Pre-earthquake Assessment of Aristotle University Buildings. 15th Hellenic Conference on Concrete 25-27 October, Alexandroupoli, Greece. Mergos, P. and Kappos, A.J. (2006). Seismic Assessment of RC Structures Using a Distributed Shear and Flexural Flexibility Model with Shear – Flexure Interaction. 2nd International fib Congress 5-8 June, Naples, Italy. Sextos, A., Kappos, A. and Mergos, P. (2004). Effect of Soil Structure Interaction and Spatial Variability of Ground Motion on Irregular Bridges: The case of the Krystallopigi bridge. 13th World Conference on Earthquake Engineering (WCEE) 1-6 August, Vancouver, Canada. Mergos, P., Sextos, A. and Kappos, A. (2003). Seismic Assessment of a Major Bridge Using Pushover Analysis. International Conference on Computational and Experimental Engineering and Sciences (ICCES) 24-29 July, Corfu, Greece. Mergos, P. and Sextos, A. (2019). Selection of earthquake ground motions for multiple objectives using genetic algorithms. Engineering Structures, 187, pp. 414–427. doi:10.1016/j.engstruct.2019.02.067 . Mergos, P.E. (2018). Efficient optimum seismic design of reinforced concrete frames with nonlinear structural analysis procedures. Structural and Multidisciplinary Optimization, 58(6), pp. 2565–2581. doi:10.1007/s00158-018-2036-x . Zimos, D.K., Mergos, P.E. and Kappos, A.J. (2018). Modelling of R/C members accounting for shear failure localisation: Hysteretic shear model. Earthquake Engineering and Structural Dynamics, 47(8), pp. 1722–1741. doi:10.1002/eqe.3037 . Zimos, D.K., Mergos, P.E. and Kappos, A.J. (2018). Modelling of R/C members accounting for shear failure localisation: Finite element model and verification. Earthquake Engineering and Structural Dynamics, 47(7), pp. 1631–1650. doi:10.1002/eqe.3033 . Mergos, P.E. (2018). Contribution to sustainable seismic design of reinforced concrete members through embodied CO2 emissions optimization. Structural Concrete, 19(2), pp. 454–462. doi:10.1002/suco.201700064 . Mergos, P.E. (2018). Seismic design of reinforced concrete frames for minimum embodied CO 2 emissions. Energy and Buildings, 162, pp. 177–186. doi:10.1016/j.enbuild.2017.12.039 . Mergos, P. (2016). Optimum seismic design of reinforced concrete frames according to Eurocode 8 and fib Model Code 2010. Earthquake Engineering and Structural Dynamics, 46(7), pp. 1181–1201. doi:10.1002/eqe.2851 . Mergos, P.E. and Kappos, A.J. (2015). Estimating fixed-end rotations of reinforced concrete members at yielding and ultimate. Structural Concrete, 16(4), pp. 537–545. doi:10.1002/suco.201400067 . Mergos, P. and Beyer, K. (2015). Displacement-based seismic design of symmetric single-storey wood-frame buildings with the aid of n2 method. Frontiers in Built Environment, 1. doi:10.3389/fbuil.2015.00010 . Mergos, P. and Beyer, K. (2014). Loading protocols for European regions of low to moderate seismicity. Bulletin of Earthquake Engineering, 12, pp. 2507–2530. doi:10.1007/s10518-014-9603-3 . Mergos, P.E. and Beyer, K. (2014). Modelling shear-flexure interaction in equivalent frame models of slender reinforced concrete walls. Structural Design of Tall and Special Buildings, 23(15), pp. 1171–1189. doi:10.1002/tal.1114 . Mergos, P.E. (2013). The anchorage-slip effect on direct displacement-based design of R/C bridge piers for limiting material strains. Computers and Concrete, 11(6), pp. 493–513. doi:10.12989/cac.2013.11.6.493 . Mergos, P.E. and Kappos, A.J. (2013). A combined local damage index for seismic assessment of existing RC structures. Earthquake Engineering and Structural Dynamics, 42(6), pp. 833–852. doi:10.1002/eqe.2247 . Mergos, P. and Kappos, A. (2013). Analytical study on the influence of distributed beam vertical loading on seismic response of frame structures. Earthquake and Structures, 5(2), pp. 239–259. Mergos, P.E. and Kappos, A.J. (2012). A gradual spread inelasticity model for R/C beam-columns, accounting for flexure, shear and anchorage slip. Engineering Structures, 44, pp. 94–106. doi:10.1016/j.engstruct.2012.05.035 . Mergos, P.E. and Kappos, A.J. (2009). Seismic damage analysis including inelastic shear-flexure interaction. Bulletin of Earthquake Engineering, 8(1), pp. 27–46. doi:10.1007/s10518-009-9161-2 . Mergos, P.E. and Kappos, A.J. (2008). A distributed shear and flexural flexibility model with shear-flexure interaction for R/C members subjected to seismic loading. Earthquake Engineering and Structural Dynamics, 37(12), pp. 1349–1370. doi:10.1002/eqe.812 . Mergos, P.E. and Kawashima, K. (2005). Rocking isolation of a typical bridge pier on spread foundation. Journal of Earthquake Engineering, 9(SPEC. ISS. 2), pp. 395–411. doi:10.1142/S1363246905002456 .